Beijing: China is set to be hit by at least five or six typhoons next month due to the La Nina phenomenon, bringing storms on land and sea, authorities here today said. The National Marine Environmental Forecasting Centre (NMEFC) said that up to six typhoons are expected to hit China next month, more than in previous years. Three or four will affect coastal areas. 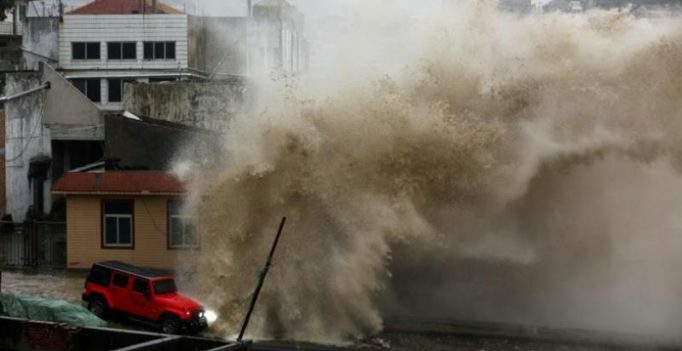 Last week, China upgraded its warning for ocean waves triggered by Typhoon Dianmu to a yellow alert from blue on a four-colour warning system. The typhoon dumped heavy rainfall across the Leizhou peninsula in southeastern Guangdong Province, leaving entire villages submerged in places. Affected by global warming and La Nina, China’s coastal sea level is higher than the same period in recent years. The NMEFC called on coastal departments to follow forecasts and be prepared for ocean disasters. La Nina is an ocean atmosphere phenomenon characterised by low sea temperatures across the equatorial eastern central Pacific. It often occurs after a strong El Nino event. On an average, half of El Nino events are followed by a La Nina, which typically affects global climate patterns in the opposite way El Nino does.